As we begin to embrace the holidays with all the thanks and giving a thought came to mind. I wondered how we could keep the spirit of thankfulness and giving in our lives throughout the year. I wondered how I could be a blessing to someone each day. Greetings in the name of our Lord and Savior, Jesus Christ. As we prepare for the banquet circuit it causes us to reflect on the season past. We think about the races run, where we finished, the obstacles we overcame and the hours we spent pursuing a better result. Countless people to thank for their efforts supporting the team. When you get right down to it we are blessed. Preparation for the banquets can be a difficult time for me. One of the tasks involved is to review the season and remember those we have lost. This has been a particularly difficult one. Jack Williams and Howie Hodge were close friends, guys I hung out with. Their missed presence has been a challenge to overcome. 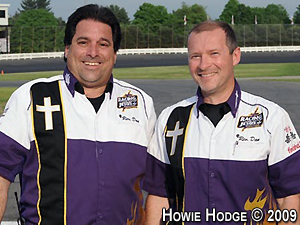 Add to that the loss of Ted Christopher and the hole left in the racing community is vast. One refrain rings true as we remember how much each one meant in the lives of others; we were better for knowing them. We call that being a blessing. Each life lost touched lives. I have heard so much about what this one did for me or how that one encouraged me. It is safe to say that in many ways the ones we have lost this year were a blessing not only to the racing community but in their personal lives also. That thought brings me back to a lunch date I had over the summer with Rev. Ray Pavkov. Read along as he shares about our time together. “Occasionally on a Monday, Rev. Don and I meet at a diner in Rocky Hill, about 1/2 way between our locations to talk about things; and the past weekend events with Racing with Jesus. Monday, we were given a choice to sit in a different area of the diner other than where we usually sit. Our server was a very congenial, talkative lady. As lunch continued and we talked, occasionally she would appear and make pleasant comments with us. As she presented us with our meal fare, we asked her if there was one thing she would like for us to pray with her before we left. She thought for a moment; then emotionally asked us to pray for her daughter, who was recovering from a serious accident. We asked her to sit down with us as we took her hands to pray. We asked the Great Physician to comfort her and provide complete healing for her daughter, and to bless her for her humble spirit. Instead of selfishly asking prayer for herself, or her job, or her own immediate needs, the mother's heart in her asked prayer for her daughter. Sometimes, the work of Racing with Jesus Ministries takes place away from the track, and in unusual places. I don't know if we will ever see Janice again; but, I know she was moved and comforted in her spirit in that moment. Pray for others when God moves you to do so. It doesn't have to be a big deal, or some great production; just do as the Lord tells you to do. It may be unto one of the least of His children. ‘I tell you this truth, anything you did for even the least of my people here, you also did for me." Thanks Ray for the reminder that we can be a blessing wherever we are, whatever we are doing. The difference comes when we take the time to look at those around us and see their needs. Being a blessing is about making a difference in the lives we come in contact with on a daily basis. Think about how you can be a blessing to someone. Think about how you can make an effort to change someone’s day. STILL ROLLING DOWN THE ROAD - With the racing season finished up I figured my travel schedule would slow a bit. Well this past weekend was full of celebrations of different kinds. On Friday and Saturday Lynda and I were in Lowell, MA as I officiated the wedding of a family friend, Russell Antoine. Some of you may remember Gogo, Daniel Antoine, he lived with us for some time and came to many races with me. Russell is Gogo’s brother. It was a joy to be a special part of this important day for the Antoine family. From Lowell it was off to another celebration in New Jersey for the Wall Stadium Speedway Banquet. Diane Krause had called me a few weeks back and shared they were planning to surprise Bob Menschner, our chaplain at Wall, with a plaque commemorating 50 years of service to the Wall community. She asked if I could be there for the special presentation. Keep it a secret, Bob doesn’t know. When I arrived Bob was the first to meet me with that funny look he has when he is trying to figure things out. He was surprised to see me and thankful that I came, but still wasn’t putting it all together. He thought something might be up. He figured I was there to bring the blessing. He was genuinely moved when they called him to the podium to honor him. Thank you Bob for your 50 years of dedication and service to the racing community at Wall Stadium Speedway. You have seen many come and go, but through it all remained committed to serve there. We are thankful for the many blessings you have given to those who have come through the gates of Wall. You sir, have given from your heart to serve, pray for and provide for the needs of the Wall community. Blessings my friend.